One of the American singer, actress, and model is Aaliyah Dana Haughton who was famous as Aaliyah. At the age of 10, she appeared on the television show named ‘Star Search’. She has earned the nicknames "Princess of R&B" and "Queen of Urban Pop". She is listed by Billboard as the tenth most successful female R&B artist of the past 25 years, and the 27th most successful R&B artist in history. Aaliyah’s full name is Aaliyah Dana Haughton. She was born on 16 January 1979 at Brooklyn, New York. She was raised at Detroit, Michigan. Her mother name is Diane Haughton who was a vocalist. Her father name is Michael Haughton who was her manager but he died in 2012. She is the younger child. She was African American. She has the elder brother named Rashad Haughton. She attended a Catholic School named Gesu Elementary where she got a chance to play in the stage show named ‘Annie’. She also performed in the church choir, weddings, and charity events. She attended Detroit High School and graduated with a perfect grade point of 4.0. Aaliyah’s height is 1.71 m and weight is 57 kg. She has black color hair and dark brown color eyes. She has the perfect body. She liked to maintain her body and remain fit so she liked to have healthy food only. On 24 May 1994, she released her debut album named ‘Age Ain’t Nothing but a Number’ by Jive and Blackground Records. It was certified two times Platinum by the RIAA. On 27 August 1996, she released her second studio album named ‘One in a Million’ with Atlantic Records as she left Jive Records. On 16 June 1997, the album was certified double platinum by RIAA. She performed a song at the 1998 Academy Awards ceremony and became the youngest singer to perform at the event. She played a film role in ‘Romeo Must Die’ which was released on 22 March 2000. She also served as executive producer of the film’s soundtracks where she contributed four songs. She played in the film ‘Queen of the Damned’ in which she played the role of an ancient vampire. In July 2001, she released her third studio album which was her self-titled album named ‘Aaliyah’. It was number one on the Billboard 200. She was signed to appear in several future films, including Honey which was a romantic film titled Some Kind of Blue, and a Whitney Houston-produced remake of the 1976 film Sparkle. She participated in fashion designer Tommy Hilfiger's All America Tour and was featured in Tommy Jean ads. She was nominated for the Grammy Award. She won the Best Female Video and Best Video from a Film awards at the 2000 MTV Video Music Awards. It also earned her a Grammy Award nomination for Best Female R&B Vocalist. Aaliyah was being in relation with R. Kelly and got married on 31 August 1994 which was illegal. Later she got separated from him. Then she dated Damon Dash who was the co-founder of Roc-A-Fella Records. Dash claimed that they were planning to marry. Read More: Who is Aaliyah's Ex-Husband R. Kelly? Aaliyah’s net worth was estimated to be $10 million dollars. After they completed filming the music video for "Rock the Boat". On 25 August 2001, the member of the record company along her boarded a twin-engine Cessna 402B at the Marsh Harbour Airport in Abaco Islands. They had a flight scheduled the following day, but after the filming was finished they were eager to return U. and made the decision to leave immediately. The plane in which they were returning crashed shortly after takeoff about 200 feet from the end of the runway and exploded. Aaliyah along with the eight other on board as pilot Luis Morales III, hair stylist Eric Forman, Anthony Dodd, security guard Scott Gallin, family friend Keith Wallace, make-up stylist Christopher Maldonado, and Blackground Records employees Douglas Kratz and Gina Smith were all killed. Gallin survived the initial impact. The plane was identified as being owned by Florida-based company Skystream by the US Federal Aviation Administration (FAA) in Atlanta. Aaliyah's funeral services were held on August 31, 2001, at the Frank E. Campbell Funeral Chapel and St. Ignatius Loyola Church in Manhattan. Her body was set in a silver-plated copper-deposit casket, which was carried in a glass horse-drawn hearse. 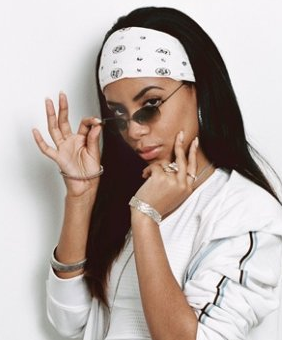 After Aaliyah's death, the German newspaper Die Zeit published excerpts from an interview done shortly before her death, in which she described a recurring dream as "It is dark in my favorite dream. Someone is following me. I don't know why. I'm scared. Then suddenly I lift off. Far away. How do I feel? As if I am swimming in the air. Free. Weightless. Nobody can reach me. Nobody can touch me. It's a wonderful feeling." She won two posthumous awards at the American Music Awards of 2002; Favorite Female R&B Artist and Favorite R&B/Soul Album for Aaliyah. In February 2002, her second and final film, Queen of the Damned, was released. In 2005, Aaliyah's second compilation album, Ultimate Aaliyah was released in the UK by Blackground Records. In June 2013, she was featured on the new track by Chris Brown named ‘Don’t Think They Know’. Christopher John Farley of Time magazine described the album 'Age Ain't a number but nothing' as a "beautifully restrained work".